The most powerful wind turbines ever seen in the state could soon be built in southwest Minnesota. The state needs to approve the proposed wind farm. The industry is ramping up turbine size in the name of efficiency, but the skyscraper-sized machines are also attracting more public opposition. Locals love the gentle lapping of waves against the rocky shore of Lake Cochrane in eastern South Dakota. It's less than a mile from the Minnesota border. But some residents, including Ron Ruud, see plans for a large wind farm just across the border in Minnesota as a threat to their serenity. "We will do everything we have to do," said Ruud. "Because it will absolutely destroy Lake Cochrane's environment. It just doesn't fit. It's an intrusion." • More: Wind projects bring opposition, opportunity to south-central Minn.
• Growth spurt: Wind power spreading in Minnesota, and around U.S. The global renewable energy company RES, headquartered in the UK, plans to put up 44 wind turbines for the Bitter Root Wind Project in Minnesota's Yellow Medicine County near the South Dakota border. Rudd says with some of them less than a mile-and-a-half away, the project will interrupt the view and produce noise. "Most of the people on the lake don't even understand how massive these things are yet," said Ruud. "We're starting to show some pictures and they're going, 'holy cow! We had no idea.' Yeah, it's shocking." 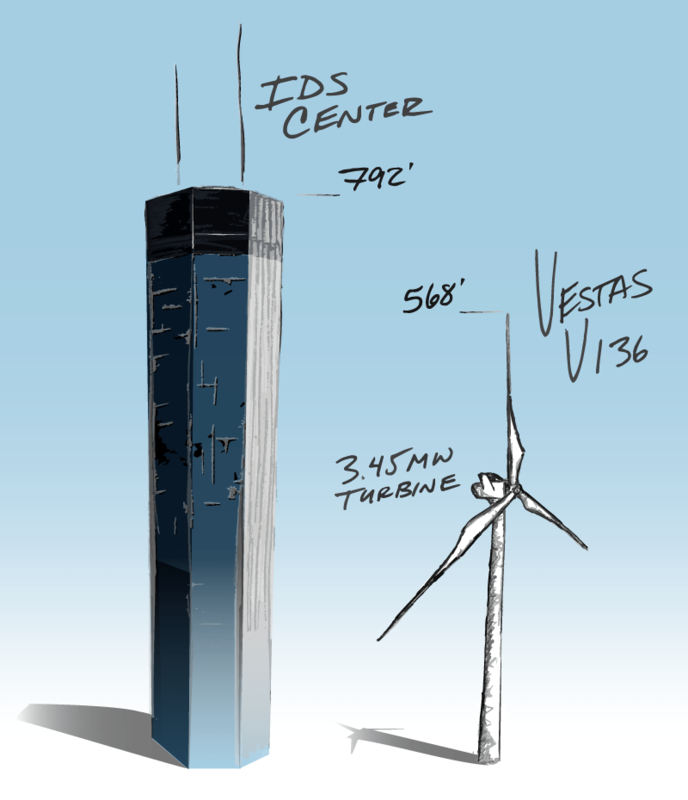 The machines stand as tall as a 40-story building, about 570 feet from ground level to blade tip. They'll generate almost three-and-a-half megawatts of electricity apiece, 50 percent more than the average U.S. turbine. Michelle Matthews is the Bitter Root project developer for RES. She says the company understands that Lake Cochrane residents weren't expecting to see a wind farm built nearby. "We've done the best that we can to really minimize the impacts," said Matthews. She says the company dropped the turbine site nearest Lake Cochrane. Also the aircraft warning lights atop the towers will blink only when a plane is near. But Matthews says the company still hopes to use other turbine sites near the lake. 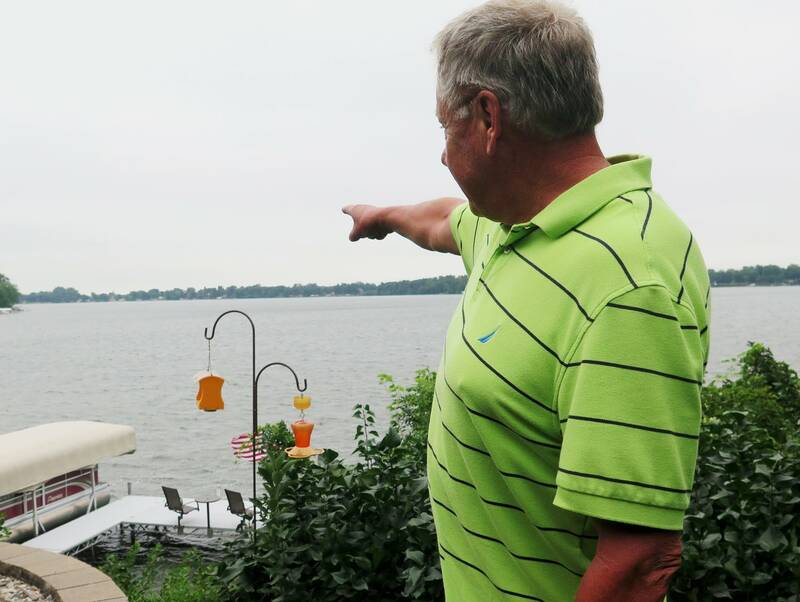 "Some of the landowners that are right in proximity to the lake on the Minnesota side really do want to have these turbines on their property," said Matthews. "One of them has been working with this project for 10 years. This is his land and this is what he wants to do with that." Each side can claim victories in the regulatory process. Just last week an administrative law judge recommended that the Minnesota Public Utilities Commission approve the project. But he also gave hope to the Lake Cochrane residents, saying the PUC should nix the turbine sites nearest the South Dakota lake. The Bitter Root project debate will likely recur in other parts of Minnesota. Peder Mewis with the renewable energy support group Wind on the Wires says these most powerful turbines in the state could become a trend. "This is the direction that we're likely going down," said Mewis. But there are hurdles. Mewis says one problem is transporting the turbine blades. Some are as long as a jumbo jet. That makes it difficult to corner on narrow country roads. "As these turbine blades get longer, the trailers get longer, and it becomes more and more difficult to make these turns," said Mewis. Extra wide turning lanes sometimes are constructed on crucial roads. Another hurdle is public opinion. The viewpoint that turbines are too big and noisy may have a powerful ally in the White House. "If your house is staring at a windmill, not good," President Trump told a rally in August. "When you hear that noise going round and round and round, and you're living with it, and then you go crazy after a couple of years. Not good!" But standing near a proposed turbine site just over a mile from Lake Cochrane, Yellow Medicine County Commissioner Glen Kack says he supports the larger wind machines. "I think the bigger ones are better," said Kack. "You don't have as many of them." It takes fewer big turbines to produce the same amount of electricity generated by smaller machines. Plus the county will get nearly $700,000 a year in tax revenue from the wind farm. And farmers will get as much as $15,000 a year for each turbine site lease. "It's a good steady income," said Kack. "We got to get these things built." Kack hopes more wind farms are in the county's future. If that happens, it's likely some will be the larger generation of wind machines.